For your benefit and security we currently accept google and paypal checkout. 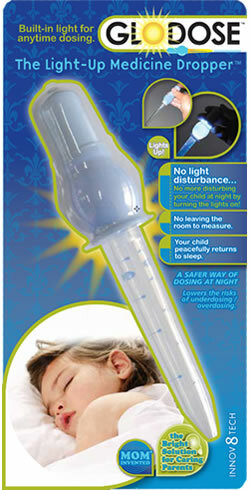 GloDose® is the mom-invented medicine dropper that makes administering medicine easier. When it comes to innovative baby products, it's still mom who knows best. With a soft glow, parents can accurately measure the medicine dosage with the lights off, leaving baby to stay comfortable and start getting healthy again. Press down at the top of the handle to illuminate GloDose®. Withdraw the correct dose as you see indicated on the dropper to deliver the exact amount. Administer the medication while your child is awake and in a position to swallow. Wash tube thoroughly in warm, soapy water before and after each use. Rinse with clean water and dry completely before storing. Do not wash the handle or immerse in water. This product is not a toy. Keep this and all medicine out of reach of children.